Fresh Coast is a restaurant in Newark, NJ, inspired by the healthy and flavorful foods of Hawaii & California. The team at Fresh Coast hit us up while they were planning to transition away from their old name, Ono Grinds Poke, a necessary move on their path towards being able to franchise their brand. As part of their rebranding they approached The Artoholiks to develop a new website that would aid them in achieving their long term expansion goals, while also offering a great experience for their longtime customers. This is who our client is most excited about visiting the website. This is who we anticipate being our most common users. We identified that both users would have fundamentally different experiences, due to their different motivations as well as the different devices they are using to access the website. We kept these factors in mind during our initial design stages, prompting us to include features that cater to one audience more than the other, depending on the circumstances. One of the key functions of this website is to help Fresh Coast with their Franchising efforts. In helping them with their goal to have Fresh Coast locations across the country, we needed to make sure this website would speak to the culture and vibe of the Fresh Coast brand, but not necessarily speak specifically to Fresh Coast’s current location in Newark. 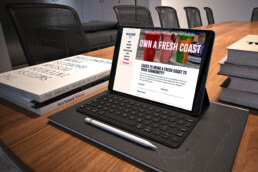 The website also had to be all around solid and professional, so that any potential franchise owner who would visit the site could see themselves as being part of the Fresh Coast story. We also built the website to account for future growth. While currently the locations page shown here is not live, it can be enabled and edited by the Fresh Coast team once they open their second location and beyond. We know that many of the website’s users will be coming to the site on their phones, possibly being directed to Fresh Coast by their large Instagram presence. Our mobile-first approach ensures users always have a great experience when using the site. To help capitalize on the needs of the customers user group, we added an additional “Order Now” button featured prominently on the bottom of the mobile website at all times (in addition to the “Order” button included in the navigation menu). A customer who saw a delicious Poké Bowl on their Instagram feed can get straight to ordering it in just 1 click after visiting any page. Recognizing that our customers might be on the go often, optimizing the loading and performance of the entire website was a key focus for us. Utilizing all of our usual techniques and extensive testing, we created an optimized experience that will load in under 3 seconds, even over a 3G mobile connection. The finished website scores top marks from web optimization tools by Google and Pingdom. 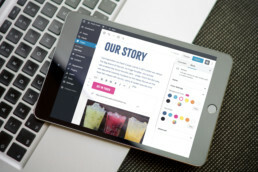 For the first time, we shipped a product utilizing Wordpress’s new block-style editor, “Gutenberg.” With the transition to this new editor, we had the opportunity to customize the editing experience in a new way, making it a joy for our clients to update their site. 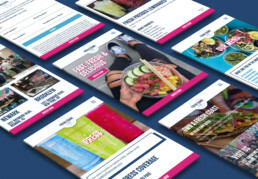 Built-in brand colors and reusable blocks give the Fresh Coast team confidence that any updates they make will hold up to the rest of the website and other branded materials.